Posted in: Wha? & Tagged: Poetry, TV. Late last year, we lost one of the gems of jazz, Dr. Billy Taylor. So far, there have been numerous online tributes, like this one at A Blog Supreme, or this one at Jazz Wax. It’s been mentioned frequently that Taylor was an educator. While that’s certainly true, it ought to be pointed out that most of the people Taylor educated were non-musicians. For many who found jazz a little esoteric and might have wondered, “Where’s the melody?”, Taylor was about the best explainer and ambassador to the uninitiated you could possibly hope for. Not only did he respond to all questions about jazz music with incredible patience, he did so in way that suggested he truly savored the explanations. Given the same inquiries, Miles Davis might have thrown something at you. It’s conceivable that you have heard Taylor talk about jazz more often than you heard him play it. His own playing sat comfortably in the mainstream, and while his style didn’t venture into the realms of say, Herbie Hancock or Chick Corea, it did what it needed to do — express Billy Taylor. To bring Miles Davis back into it again, Taylor once said of him that it’s much harder to play with simplicity than it sounds like it might be. So true. There are many great clips featuring Taylor on YouTube. Below, Billy talks about National Educational Television’s pioneering show, The Subject is Jazz, that aired nationally on NBC in 1957-58. 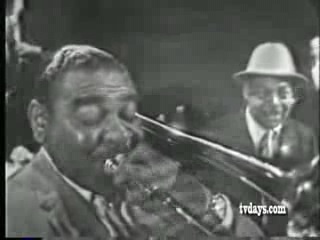 In the original clip, Taylor explains “Cool Jazz,” and the featured group performs a version of Tadd Dameron’s Hot House, and Miles Davis’s Half Nelson. Posted in: Jazz	& Tagged: bill taylor, educational, jazz, media, TV. Happy New Year! The following article ran on Commander Trombone in 2005. As you might or might not expect, Commander Trombone has by this time played numerous gigs on the trombone. Trust me, if you were to read my résumé, you’d quickly see that the word numerous is used numerous times in regard to gigs. Some time ago, one of the aforementioned gigs was playing trombone on a cruise ship. I played in the show band. As its name suggests, the show band played for the cruise ship shows. It was a kind of all-purpose musical organization whose functions included “playing on” comedians, jugglers, and magicians, playing with the occasional competent singer, and playing light dance music for the older cruising demographic. The show band did not play top forty cover tunes or Texas Two-beat — there were other bands on board for that sort of thing. For dancing, we played simple adaptations of big-band tunes, waltzes, tangos, etc. After a long night of shows for the cruisers, the show band was often obliged to play a late-night dance set. When we needed to clear the room — perhaps because we had had enough and wanted to retire to our cabins or the bar for the evening — one kind of tune was guaranteed to get the job done: a polka. Almost always, a simple rendition of Pennsylvania Polka would be enough to make our listeners lose interest and wonder what was being served at the Midnight Buffet. Make no mistake, however: Polkas are a constant fountain of joy for some. Specifically, happy people. To clarify a bit, not all happy people are polka lovers, but polka lovers are generally happy people. In fact, that’s how Big Joe describes his polka-dance show: Happy Music for Happy People. If you’ve never heard of Big Joe or the Big Joe Show, it’s probably time you did. Currently, the program airs Wednesday and Saturday night on RFD-TV, a network that is carried by Dish Network and DirectTV. The Big Joe Show is a polka dance show. It’s not your father’s dance show like American Bandstand or Soul Train, it’s your grandfather’s dance show — if your grandfather really liked polka. Big Joe himself, who is always clad in a colorful, shiny, piano vest and cummerbund. Who lives, sleeps, and eats polka? Big Joe does. All the bands on the show are live bands, featured in the same space as the actual dancers. The quality of the bands varies greatly — some are quite good, but there is the occasional tubist whose batting average in relation to hitting the correct notes is quite low. You get the picture — tuba farts to a polka beat. The dancers. There won’t be any of the self-conscious dancing you see on the MTV. These are not self-consciously “cool” people. These are simply happy people. Remember — happy music for happy people? The production values on The Big Joe Show vary greatly. For example, a typical episode features video that turns from hazy and washed-out to completely clear depending on the camera and camera angle being used at a given moment. This camera effect, combined with the styles of eyeglasses and hair, make it harder to guess what decade all this dancing and merriment is taking place in. Below are some Quicktime samples of the show. If you can, though, tune in and turn on to the Big Joe Show at the next available opportunity. Posted in: Music, Recommended, Wha? & Tagged: music, polka, TV.